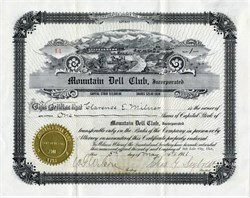 Beautiful certificate from the Mountain Dell Club issued in 1911. This historic document has an ornate border around it with a vignette of scenic mountains. This item has the original signatures of the Company's President, and Secretary, and is over 102 years old. Mountain Dell (Salt Lake) is in Parleys Canyon where Mountain Dell Reservoir is presently located. The road through the canyon was built by Parley P. Pratt and was opened for traffic on July 4, 1850, under the name of the Golden Pass. In 1860 Leonard G. Hardy opened a rest stop known as Hardys Place. The name was then changed to Mountain Dell in 1869. Ephraim K. Hanks, one of its first settlers, contributed to the naming of the settlement. In time Mountain Dell became a small farming settlement, a Pony Express stop, and stage station. By 1910, the community of approximately one hundred people began to die out because of improvements in transportation. In 1916 Salt Lake City bought the land for a dam, reservoir, and recreation site.